Iadmit it. I have a weakness for pumpkins. Pumpkin lattes, pumpkin pie, pumpkin spice muffins, pumpkin whoopie pies, if it’s got pumpkin in the title I’m probably going to love it. Few ingredients can evoke an entire season like pumpkins. However, while I am always down for a sweet pumpkin treat, especially this time of year, the spotlight is rarely on savory pumpkin dishes — and what a pity that is. 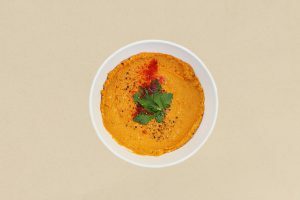 One of my favorite go-tos is pumpkin hummus. This is not your run-of-the-mill hummus. It’s filling, it’s earthy, and it’s a great way to spice up a snack staple. And – not only is it delicious, but it’s packed with fiber, vitamin A, vitamin C, and other vitamins and minerals. For moments when you feel like changing up your classic hummus recipe, our amazing pumpkin hummus is a great alternative for fall, or year-round. Consider pairing this with pita, veggie sticks, or even as a spread on a turkey sandwich. Personally, I like pairing mine with a Sauvignon Blanc or a Chenin Blanc, but that’s not as family friendly. Pumpkin. Tahini. Spices. The perfect switch-up for your traditional hummus recipe. In a medium-sized mixing bowl, combine pumpkin puree, tahini, garlic powder, olive oil, cumin and sea salt. If you're serving to a child under the age of 1, make sure to omit the salt.